Born in 1983 in Hà Nội, Nguyễn Thị Thanh Mai graduated from Huế College of Arts in 2006 and completed her M.A in Visual Arts at the Mahasarakham University, Thailand in 2012. Thanh Mai works with a variety of media, including photography and video. Her earlier works concentrated on issues relating to women’s experiences and rights in Asian social contexts. Recently, her practice has turned to questions of identity, both personal and collective, including issues of migrants’ experiences and rights. She explores the complex relationships between individuals and society, and the role of fantasy and imagination in people’s conception of their existence. 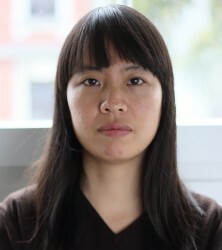 In 2014 Thanh Mai was awarded the Pollock-Krasner grant. Notable exhibitions of her work include Another World (Kunstlerhaus Bethanien, Germany, 2016), Scars (Gallery PM, Croatia, 2016) and Day By Day (Sao La Art Space, Hồ Chí Minh City, Việt Nam and SA SA BASSAC, Phnom Penh, Cambodia, 2015).